The Vikings, the famed Scandinavian warriors, started raiding Ireland in 795 and plundered it for decades, before establishing two Irish outposts, according to the Annals of Ulster, a 15th century account of medieval Ireland. One outpost, Dúbh Linn, became Dublin, the other, Linn Duchaill, was lost in time. Perhaps until now. A team of archaeologists announced on Friday that it has found the lost Viking settlement near the village of Annagassan, 70 kilometers north of Dublin. “We are unbelievably delighted,” said archaeologist and team leader, Mark Clinton, an independent archaeological consultant. The Annagassan locals have long believed they lived near an ancient Viking town or fort. The stories of Viking raids were told to local children by schoolteachers, and there were also occasional finds that underscored this story. For example, a few years ago, a set of handcuffs once used to shackle Viking slaves was found by a farmer ploughing land. The modern search for Linn Duchaill began 5 years ago when a local filmmaker named Ruth Cassidy, a member of the Annagassan and District Historical Society, enlisted the help of Clinton, a family friend, to find the lost Viking town. They searched through 2005, 2006, and 2007 and were on the point of despair when they came across a flat area—ideal for lifting boats out of the water for shipbuilding and repairs—a couple of kilometers up the River Glyde. They managed to secure funding to pay for a geophysicist, John Nicholls, to survey the site. Nicholls found a series of defensive ditches about 4 meters deep, running in lines. The pattern of ditches does not seem compatible with the typical Irish structure of the period, a ring fort, and no evidence of a Norman settlement, such as moat or castle remains, was found. That left just one other option: Vikings. Despite this evidence, the researchers struggled to secure funding for excavation work. But the local Louth County Museum eventually offered funds to excavate at three locations. 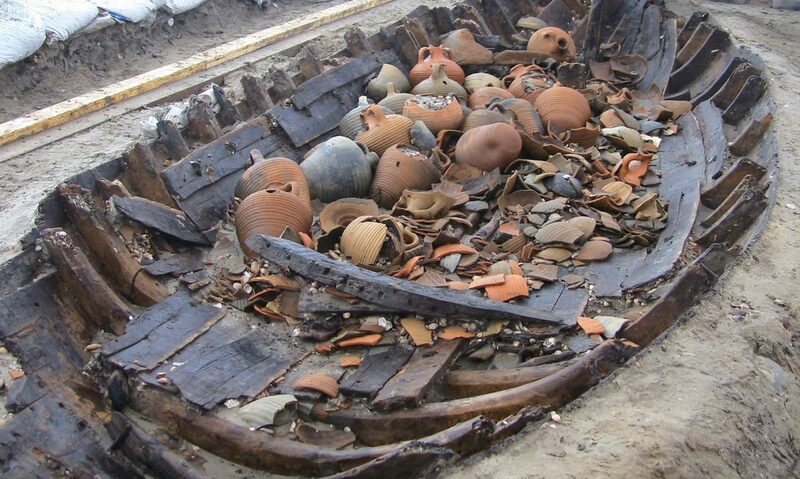 The team found 200 objects in 3 weeks, convincing them that they had found a major Viking shipbuilding town. There is evidence of impressive engineering, with an artificial island constructed out of the landscape to offer protection from attacks by the indigenous Irish. There is evidence of carpentry, smelting, and ship repair, with ship rivets dotted around the site. These features alone would make the site significant as few Viking longphorts—or shipbuilding towns—have been excavated. The team also found hacked coins, which Clinton says were a typical “calling card” of the Vikings, but there is also a total absence of pottery—the Vikings used wooden bowls. There are “high status” early Christian objects, too, probably stolen from the Irish. One lingering question is why Linn Duchaill was abandoned while Dublin thrived. One theory is that because Dublin has better 24-hour access to the sea, it meant that the Vikings there could take to their ships and head out when they were under attack. At Linn Duchaill, tidal fluctuations would cut off access for several hours a day. Next PostNext Consultation on Stonehenge and Avebury – Have your say!